It’s an Old Testament name that’s yet to make a comeback. 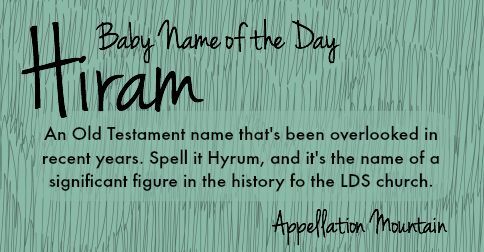 Thanks to Silent One for suggesting Hiram as our Baby Name of the Day. Hiram could be Hebrew in origin, in which case the name means something like “exalted brother.” More likely, it’s an older Phoenician name, in which the case the meaning is a mystery. Born around 1000 BC, Hiram was King of Tyre. 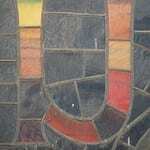 He was a contemporary of kings Solomon and David, and had a long and successful reign. He sent craftsmen and materials from Tyre to Jerusalem to help build the First Temple. I’m not sure how often the name might have been used between all those centuries BC and the Protestant Reformation, but it doesn’t seem to have been terribly common. 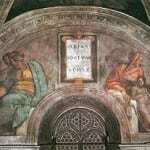 Following the Reformation parents embraced Old Testament names like Hiram. By the time the US starting recording baby name data in the late nineteenth century, the name ranked in the US Top 200. Hiram Walker pioneered a new whisky distilling process in Windsor, Ontario, just across the river from Detroit. Canadian Club has been made in the same location since 1858. Early California settler Hiram Leavitt came for the Gold Rush, and lent his surname to plenty of places, including a mountain and a lake. Hiram Edson was an early leader of the Seventh-Day Adventist Church. One of the first presidents of Paramount Pictures answered to the name. Hank Williams, Sr. was born Hiram King Williams, back in 1923, as the name was starting to fade. Williams is among the best known singer-songwriters of all time, as well as a legend of country music. Early Mormon leader Hyrum Smith was the brother of church founder Joseph Smith, Jr.
Hyrum was also a witness to Joseph’s revelations, and an early leader of what would become the Church of Jesus Christ of Latter Day Saints. He held a number of important posts while the believers moved West, sharing his brother’s prison cell in Missouri and remaining one of Joseph’s most trusted advisors. Hyrum was appointed Assistant President, his brother’s hand-picked successor. As fate would have it, both men were murdered by a mob while in prison in Illinois. Hyrum had eight children by two wives. A son named Joseph F. Smith later became president of the Church of Jesus Christ of Latter-Day Saints; a grandson called Joseph Fielding Smith also held the post. There’s an active family association for his many descendants. It’s easy to see how an obscure spelling of the Old Testament name could be boosted by such an influential figure. In recent years, it’s been the name of Veronica Lodge’s tycoon dad in the Archie comics. On Glee, one of Rachel Berry’s two dads also answered to Hiram. Overall, this name has been neglected. It has not ranked in the US Top 1000 since the 1980s, and just 100 boys given the name in 2014. That’s not obscure, but in an age of Biblical boys, it’s surprisingly under-the-radar. Interestingly, there have been nearly as many Hyrums – 98 in 2014. 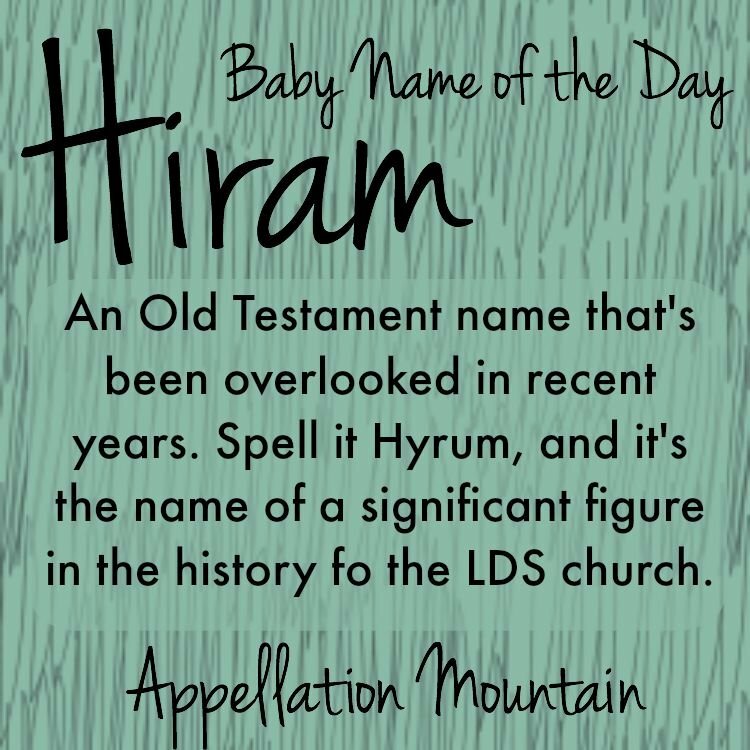 And while Hiram has languished, the number of children named Hyrum is far greater than in years past. 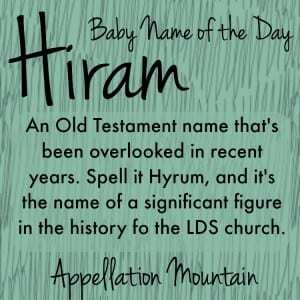 If you’re after an obscure but wearable name from the Old Testament, Hiram is one to consider. And if it’s a Mormon heritage choice you prefer? Then Hyrum could be the name for you. What do you think of Hiram? Would you any form of this name? Laura Ingalls Wilder had an Uncle Hi, which I think is just an awesome nickname and is my main reason for wishing this name would come back into the mainstream. I believe on the American version of Shameless, Joan Cusack’s character names her grandson Hyram and calls him Hymie after her own father. No Worries. Hope you are having fun in the UK!